While presenting at Rail~Volution last month in Minneapolis, I had a chance to ride the Green Line, a new light-rail between downtown Minneapolis and downtown St. Paul. The 11-mile line bears a striking similarity to the proposed Purple Line here in Montgomery and Prince George's counties. Like the Purple Line, the Green Line faced resistance from a Republican governor and concerns about gentrification and neighborhood disruption from nearby large immigrant communities. But it's how the Green Line interacts with the University of Minnesota, and how community leaders came together to make it a success, that might be the biggest lesson for our area. Like the Purple Line, which would pass through the University of Maryland, the Green Line travels on Washington Avenue, the main street at the University of Minnesota. Washington Avenue before and after. Photos from Google Street View. 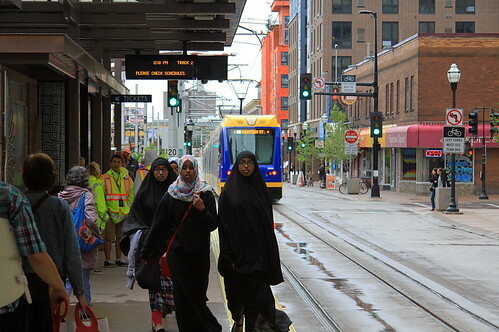 The University of Minnesota, also known as the U, opposed banning cars from Washington Avenue, a busy commuter route into downtown Minneapolis, and turning it into a transit mall. Scientists in the over 80 labs along the street worried that vibrations from light rail trains would disturb their research. Officials preferred a more circuitous route that went north of the campus, which would inconvenience fewer drivers but also reduce transit access to campus. The U sued to block the project, but after negotiating with the regional Metropolitan Council, officials eventually came to an agreement. The council would pay to reduce vibrations and electromagnetic interference, while the U would move some labs away from the line. Since then, the U has worked to make the Green Line as successful as possible. It distributed over 6,700 special passes to students, faculty, and staff that allow them to ride between the three on-campus stations for free, and rerouted campus buses to divert more traffic away from Washington Avenue. 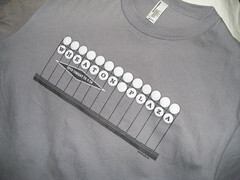 A plaza runs down the middle of Washington Avenue, with light rail and bus/bike lanes on the sides. Photo by the author. 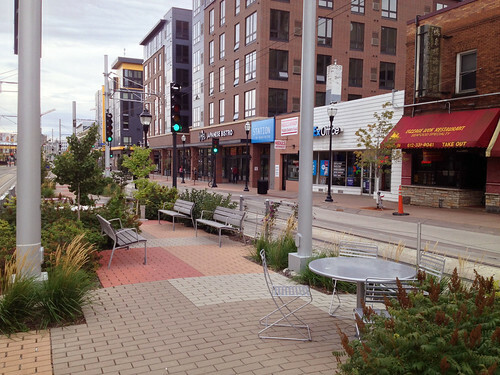 The U's cooperation with the Metropolitan Council meant that the Green Line could transform Washington Avenue from a traffic sewer to a gathering place. Today, the street feels like a natural extension of the campus. Trains run down the middle of the street, and there are shared bus and bike lanes on either side. The sidewalks are wider, and the crosswalks have special paving materials to make them more visible. There's also more green space than there was before. Since the Green Line stations are in the center of the street, there's a space between the tracks. It would have been easy to just make it a grassy median, or find a way to squeeze in a car lane. Instead, it's a plaza with tables, chairs, and lush landscaping. Bikes, buses, and transit share the reconfigured Washington Avenue at the University of Minnesota. Photo by the author. A significant amount of development is happening around the Green Line as a result. Over 2,500 apartments have been built around the U's three Green Line stations, with another 2,000 in the pipeline. New shops and restaurants have opened along the tracks to cater to the influx of students. When I visited, Washington Avenue was bustling with students walking to class, cyclists headed downtown, and light rail trains gliding down the street. It was a nice place to be, but it was still a transportation corridor. In fact, the transition was so seamless that it wasn't until I flew home and I looked at a map that I even realized cars were banned from part of the street. The development around the Green Line, coupled with the dramatically improved walking and bicycling environment, supports and reinforces the use of transit, making the Green Line more successful. Even before the line opened, 20% of faculty and staff and 40% of students used transit. But since the Green Line opened, it already has over 40,000 riders each day, higher than the projected ridership in 2030. 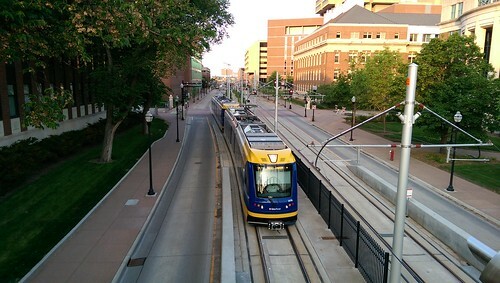 The three University of Minnesota stations are the line's busiest. Passengers wait for a train on Washington Avenue. Photo by Michael Hicks on Flickr. And diverting drivers away from campus hasn't created the traffic congestion that some people feared. In 2011, there was an average of 18,800 cars on Washington Avenue through campus each day. According to the state's traffic counts, some of those cars have shifted over to nearby University Avenue, which had an increase over 8,000 cars since then. But on other nearby streets, traffic increased by a very small amount, or even decreased. It's likely because some drivers chose to take the Green Line instead, opening up street space for others. The Green Line required leaders to accept that, in order for transit to be successful on Washington Avenue, it had to be seen as a place for people, not just for cars. This is standard operating procedure in other countries, where transit usually gets top priority, but here it requires some persuasion. Hopefully, the success of projects like the Green Line can be a guide for leaders in the DC area as they try to build transit that not only moves people, but creates stronger places. 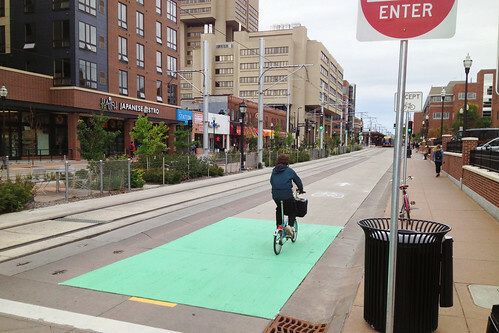 As a transplant from Mpls who's missed the bulk of the Green Line development, I appreciate this positive review and illustrations of how the line has brought improvement and vitality to what used to be a no-walk-zone-Washington Ave. 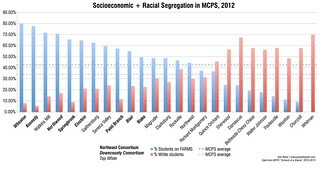 Projects like this come with controversy, and a lot of it was real with this line (including some equity concerns, etc.). It's important to step back (as this post does) to show the benefits that do occur, and hopefully we learn that all parts of our community deserve such enhancements. Thanks for this post and great dialogue.